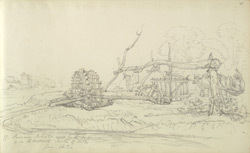 Pencil drawing of a Persian wheel by Robert Smith (1787-1873) from an album of 29 drawings (29 folios) of landscapes and architecture in the Punjab and Uttar Pradesh, 1812 and 1813. Inscribed on the original cover is: 'No. 4. Rewarry & Seik Country: Siharunpoor & Hurdwar. Lines of March etc. '; on the inside of the cover is: 'Drawn by Col Smith. R.E. Owner of the extensive round house at Paignton, Devon. Book of Sketches sold by auction at the above house - 4 of the books purchased by me. J. Pethwick. The Colonel was splendid as a draftsman, but the worst possible as a painter.' The drawings are inscribed with titles in pencil. The Persian Wheel is a device driven by a bullock (or buffalo or camel) whose motion turns a horizontal wheel which in turn drives a vertical wheel connected the the third, larger one which reaches the canal. Water is lifted by the pots on this wheel and transferred into a channel for irrigation. The invention of the Persian Wheel greatly improved agricultural productivity on the sub-continent with one wheel irrigating up to one hectare of land.